Rainbow Dash's "Magic Wands" Recipe for a My Little Pony Marathon! Rainbow Dash’s “Magic Wands” Recipe for a My Little Pony Marathon! Bubbles has become a huge fan of My Little Pony in the last few months. We generally watch an episode or two in the mornings together, often while playing along with a couple of her My Little Pony figurines. The My Little Pony: Friendship is Magic episodes are a little different than the ones I vaguely remember watching as a kid myself. The colors are more vivid, the animation is more defined. But what hasn’t changed are the sweet lessons the show imparts. When I found out that My Little Pony: The Complete Collection (the classic TV shows) is coming to DVD on September 30th, I was pretty excited. Now Bubbles can see the same episodes I did when I was younger. And because I was offered a free review copy, she’s already had the chance to enjoy a few of them. 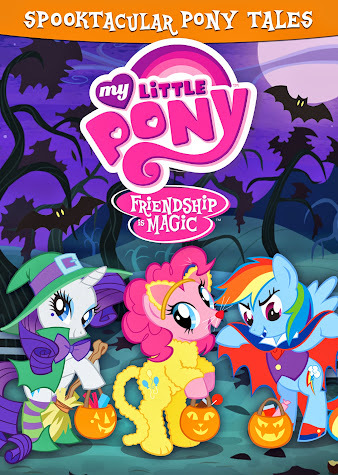 We also received the My Little Pony – Friendship is Magic: Spooktacular Pony Tales DVD. It released back on September 9th, so go ahead and order your copy now. Bubbles has loved all the (non-scary) “spooky” stories involving her favorite My Little Ponies. Plus it comes with a free poster that she promptly hung in her room. Line a baking sheet with wax paper or aluminum foil. Set aside. Melt your discs or bark according to the package directions. I poured mine into a tall drinking glass to make it easier to dip the pretzel rods and get a better coating. Dip pretzel rods, one at a time, into the melted candy coating. Swirl until 2/3rds of each rod is evenly coated, leaving a non-dipped section at the bottom. Hold the rod over the baking sheet and shake on the sprinkles, turning as you go. As you finish each rod, place on baking sheet. When all rods are decorated, set aside for 30-60 minutes until “set”, then enjoy! My Little Pony Friendship is Magic – Spooktacular Pony Tales features 6 episodes and a sing-along. The DVD also comes packed with spooky fun including My Little Pony Friendship Is Magic pumpkin carving stencils and a color Halloween poster perfect for seasonal decorating. 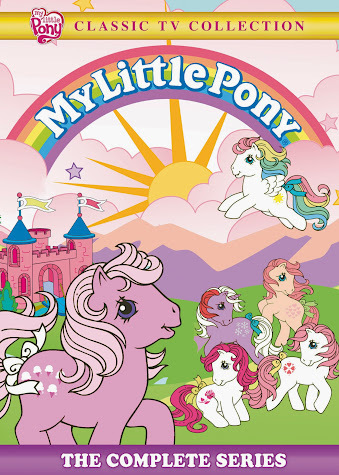 My Little Pony: The Complete Series features all 65 episodes and returns you to Ponyland, the home of all your favorite classic Little Ponies including the Earth Ponies, Unicorns, Pegasus Ponies, Flutter Ponies, Sea Ponies, Baby Sea Ponies, their human friends Megan, Danny and Molly and, of course, their dragon friend, Spike! Who is your favorite pony: Rainbow Dash, or someone else? I remember when My Little Pony first came out. It seems like it was SO long ago. They’re so adorable. I absolutely love the color palette— so pretty! And they’re sweet. We love My Little Pony. I actually played with the Dolls myself when I was little and my daughter has a container as well. Your dessert looks yummy! My niece would love these “wands”. She watches My Little Pony all the time. I love how you called them magic wands. This is just too cute! Those wands are magical. They would disappear in my house. 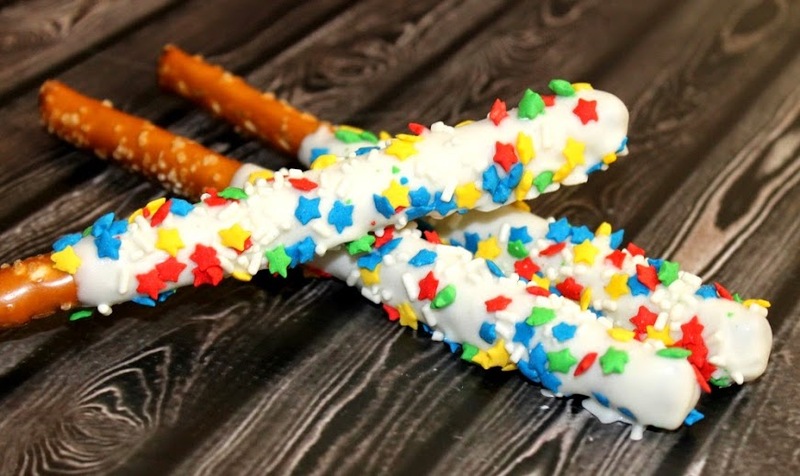 The pretzels do look like little magical wands! MLP is a staple must watch still! What a perfect and easy pay treat! They turned out so cute. So cute! My granddaughters play with my teen daughters’ Ponies. I think we will make some of these next time they are over. I didn’t realize My Little Pony was popular again–my friends and I played with them! 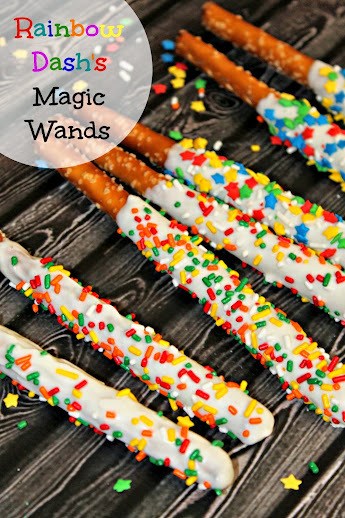 These pretzel sticks/magic wands are the cutest and are so clever. Great for a My Little Pony party.